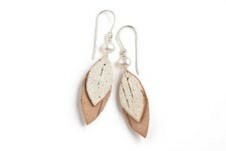 Hand shaped salvaged birch bark leaves pair up with a soft freshwater pearl for a feminine look in this unique earring design. 1 1/2"x1/2" on sterling silver ear wires. Each piece is hand crafted in the USA. Minor variations in color, texture and size make each piece truly one of a kind.